Two centre based holiday staying in hotels in the Chichilianne Valley at the base of Mont Aiguille and in Gresse en Vercors at the foot of Grand Veymont. Warm welcome and tasty cuisine. All meals are included in your holiday price. The Vercors is a magical destination for a self-guided walking holiday, where gleaming vertical cliffs meet wild and desolate plateaux. Designated a French Regional Park, the Vercors in the French Alps is made up of large valleys, limestone plateaux, deep gorges and gigantic cliffs several hundred metres high. The main mountain summits are to be found on the eastern fringe of the range where the Grand Veymont reaches 2341 metres in height. These summits give rise to some exciting trails and some amazing panoramic views of the alpine mountains. One of the most cherished views is that of Mont Aiguille, an awesome rock tower cast off from the main cliffs. Your self-guided walking holiday in the Vercors stays 2 days to the north of Mont Aiguille and 2 days to the south. Traversing between the two, your walking holiday allows you not only to have remarkable views of Mont Aiguille but also to climb the highest summit in the Vercors and explore the unique limestone plateau. A remarkable landscape of gorges and canyons which will take your breath away. In addition, the mountains of the Vercors are home to a host of natural and man made wonders including extraordinary caves and waterfalls, natural wells and awesome gorges. In addition, the Vercors played an important part in the history of the French Resistance. Many of the villages and mountain passes saw bloody combat and loss of life, and today a number of memorials help to remember the war-time events. The Vercors is a haven for wildlife with deer, wild boar, hares, chamois, marmottes and the famous alpine ibex (Bouquetin) roaming the upland slopes. As for the flora there are 80 protected species represented on these alpine crags and mountains. 4 day's self-guided walking with 2 circular walks from your accommodation and 2 walks between your guest houses creating a tour of Mont Aiguille. Walking per day amounts to an average of 5 - 7hrs walking (not including lunch stop) and 850m of ascent and descent. Maximum altitude gain in one day is 1,050m. There are options on 2 of the days to make it harder or easier as desired. The walks take place on paths, although they are mountainous and rocky in nature. You should have a reasonable level of fitness and be comfortable with walking on mountainous terrain. You should also be sure-footed on mountain paths and have a good head for heights. Pick up from Monestier de Clermont train station and transfer to your guest house in Gresse en Vercors. Leave after breakfast and transfer to train station at Monestier de Clermont. You'll stay in a couple of charming hotels, one two star in Richardi�re right at the base of Mont Aiguile and the other a lovely 3 star hotel in Gresse en Vercors. Comfortable accommodation in great settings with a warm welcome and great cuisine. Full board accommodation. Short transfer between Monestier de Clermont train station and your guest house before and after your walking holiday included in holiday price. Eurostar & TGV from London St Pancras to Lyon Part Dieu direct and changing at Paris or Lille. The journey takes about 6 hours. TER local trains run regularly to Grenoble. Occasionally TGV trains run direct to Grenoble. At Grenoble take a local TER train towards Veynes or Gap and alight at Monestier de Clermont. The airlines Easy jet, Flybe and British Airways have scheduled flights from the UK - Luton, Gatwick, Birmingham, Edinburgh and Heathrow - to Lyon St Exupery airport. Limited number of direct TGV trains from the airport to Grenoble. 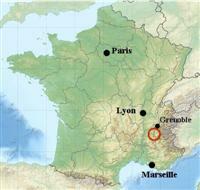 Otherwise shuttle bus or tram to Lyon Part Dieu station and TER train to Grenoble. See above for trains to Monestier de Clermont. Please visit our travel shop for links to useful sites for reserving airport parking or booking train tickets. Note: Please check concerning the availability of a holiday before booking any flights or train tickets. If you need further information or would like to discuss any aspect of your travel arrangements, please contact us, we’re here to help you. Channel crossings from Dover are provided by a number of operators including P&O Ferries, Eurotunnel and DFDS Seaways. Once in France, the journey from Calais to the Vercors area takes about 9 hours (excluding long breaks). Tolls amount to about 45 euros each way. Parking at your guest house in Ruthiere possible for the duration of your walking holiday.